A southern Ontario farmer plans to tweet a photo of his operation every day in 2015 in an effort to educate people about what farmers do on a daily basis. Andrew Campbell farms 200 hectares with his wife and parents in Middlesex, between Windsor and London. Campbell said he enjoys photography and loves talking about the family farm, so he plans to combine the two — for 365 days — beginning New Year’s Day. He's tweeting from the handle @FreshAirFarmer. He has nearly 7,000 followers. His family harvests cash crops and milks a herd of 50 dairy cattle. 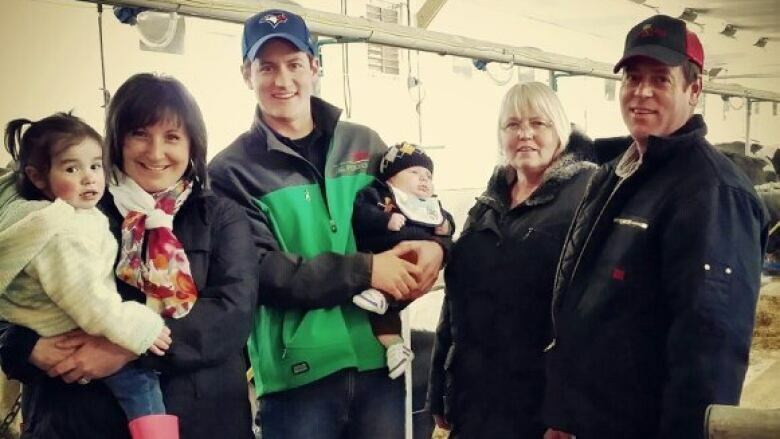 He hopes to use social media to show people what an average Ontario farm looks like and how it works on a day-to-day basis. He said he’s doing it because it’s important to connect with the consumer. “People are so interested now in where their food comes from today. I think one of the things missing from the conversation is how is that food produced? I hope people get a better understanding for all those things that do happen on the farm and go toward producing food,” he said. He plans to post the photos to Twitter, Instagram and eventually in an album on Facebook. Campbell says he has no detailed plan, so the photos will be candid and in the moment. He said the photos will be “nothing too crazy,” just an illustration of what it looks like when he milks cows, seeds corn and harvests crops. He said he’s a little concerned about where he will get a photo every day but said a lot of people are curious. Campbell said he’s committed to the project, no matter what’s going on down on the farm. “The birthdays, getting sick, now matter what, the cows still need attention, the farm still needs attention. Mechanical problems do happen and maybe that’s the picture of the day. It’s not all fun and games,” Campbell said. Most of the photos will be taken with a smartphone, said Campbell. He’s not yet sure what his first photo will be. He’s asked his Twitter followers for suggestions. They’ve requested the sunrise and the alarm clock, which rings at 4:45 a.m. every day. Campbell has New Year’s Eve plans, so he thinks the alarm clock has potential. “A short sleep on New Year’s Eve is always part of the fun,” said Campbell. Others have asked for a baby New Year type picture of a calf, which may be possible. Campbell has two pregnant cows, ready to give birth any day. “It would be an awesome, but what are the odds the baby arrives on that day?” he asked.